Hi guys. On Thursday I went to my surgeon for a follow-up and due to weakness and exhaustion and medication I was not able to drive so I had to make use of Lyft drivers to get me there and back. Thankfully I was able to find a discount card that cost me $4.99 for $4 off a limited number of rides so I saved $3 all together. Unfortunately that's where my happiness as a new Lyft customer stops. As a disabled passenger with a cane for walking and a portable oxygen machine I was walking slowly and due to my pain and weakness I was really hoping that the Lyft drivers would offer to open the door for me when I was picked up and dropped off as the majority of my Uber and Ventura Transit drivers had done in the past. For both rides, I had to open and shut the doors myself without even an offer to open the door for me. I was quite stunned. It was not as if I looked "normal". Excuse me, driver, but do you see the lady with a cane who is walking slowly with a big and heavy oxygen machine on her shoulder? Is male chivalry gone? Those were just a few of the thoughts running through my mind as I walked to the car and there was not a hint that the driver cared or was going to even open his window to ask if I needed help. Very disappointing. After the first ride, I thought maybe that was an oddity and that the second driver who picked me up from the doctor would be different. Nope. Very disappointing, again. We understand that our passengers have varying needs, and we aim to exceed expectations at every turn. If you'd like to request additional assistance from your driver, you may consider sending them a text message or placing a call once you are matched with your driver. Seriously? We have to go the extra step ourselves? The disabled have to be the ones to text or call our drivers just in order to get help? Why is it necessary for the disabled to make the extra effort when hiring a driver? We are paying YOU, right? Again, I was left disappointed. I know I cannot change the experience that you had but I can assure you that you will never be paired with this driver moving forward. Also, we will do necessary investigations with the driver and ensure that the proper actions are taken accordingly. I'd love if you'd give us another shot to prove how great Lyft can be and how important it is to have you as part of the Lyft community. So what do you guys think? 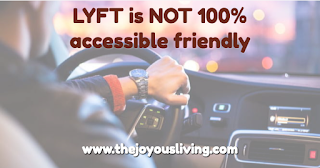 Is LYFT accessible friendly? Should the disabled have to go the extra mile even as the paying customer? I will be needing a ride to my doctor on Tuesday so we'll see if there's any difference with the drivers and maybe I'll text one of my two drivers on the day to see if it makes a difference. Weirdly, the executives response to you made me laugh. I mean seriously? I can understand your issue because with OLA I have had some pathetic issues too. got another reply from support and its just ridiculous why even bother writing me if it's a bunch of bS and not relevant. Really bad expeeience. But I still believe most of the driver are nice and willing to offer help. Very unlucky you got a bad one. I had TWO bad drivers/experiences so we'll see how the next two experiences are tomorrow when i visit the doctor. hmm, I didn't know they are not accessible friendly. Cause usually the transportation should have it, for convenience of that person. I actually think it's sad that the driver's don't do this out of themselves. Anyone with a bit common sense should offer assistance to those they can clearly see are in need. I do not think it is fair that you should take the first step, they in their right minds should see you need help. I hope you never have to go through this again! thank you CHLOE. I appreciate your support and understanding. Lyft is a rideshare service, they are not there for medical transportation. If the passenger was in that bad of shape, ask a family member, neighbor or trusted friend for a ride and assistance. The Lyft driver is a complete stranger with a modest background check, no training and is not an employee of Lyft. As a Lyft and Uber driver myself I would expect nothing more from my driver than to get me from point A to point B, nothing more. Anon - that seems pretty harsh. yes it is not a medical transport but common courtesy is not a thing of the past, is it? is opening a door too much to ask for? There are just some people who dont care about others. Its sad that it does exist. I hope you are okay! Thanks @AIAI for your compassion and understanding. I can't believe that they failed to help you. It should be instinctive that if you see someone struggling that you offer help. Hope you have a better experience next time. you would think... common courtesy is a dying art it seems. and they wonder why they don't get tips. Hmmm. That sounds like a terrible experience. Never heard of this company before. Not sure we have them here. Good you won't be paired with the driver again if you wish to use the company again. apparently if you rate a driver 3 stars and under they company makes sure you aren't paired again so that's nice. I am so sorry for that bad experience. In that reasons and in that way I can say that the driver itself really gives you a bad and uncomfortable service and hope that the company do something about and promised that it will never happened again. I am sorry you had two negative experiences like that. I have never used these types of service, so I am unsure of what to expect. But I dont know...if I was a driver and I saw someone with a cane and an oxygen pack I would offer to help based on human instinct. I hope you have a better experience next time. Are there other transport services you can look into? Some areas have transport services specifically for those getting to medical appointments. This doesn't sound good. Sorry to hear what you have been through. That is so frustrating! The drivers definitely should have offered help. Hope you will find a better ridesharing service!